A hilariously illustrated, quirky, and fun guide to all things astronomy, from the planets and comets to black holes and supernova! You'll learn something new about this huge universe of ours every time you turn the page in The Know-Nonsense Guide to Space. Start by learning about the different planets in our solar system, all the way from Mercury to Neptune and beyond. Then reach out further and discover about the Milky Way Galaxy and other neighbouring galaxies (and what is in them). On the journey through space, learn about different terms like asteroid belt, nebula, and supernova. Even learn about mysterious black holes! 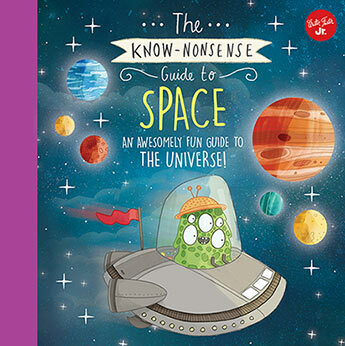 The Know-Nonsense Guide to Space turns what can at times be dry topics into something approachable and fun. Full of quirky and hilarious illustrations, kids will love learning so much they might even laugh out loud. Heidi Fiedler has written and edited more than 300 books for clients ranging from Target to Barnes & Noble. As a former editor for Teacher Created Materials, she has a wealth of editorial and writing experience, including more than 180 non-fiction books in partnership with Time for Kids; 90 picture books, chapter books, and middle-grade novels; plus a wide variety of activity books and arts and crafts books. Brendan Kearney is a children's book illustrator based in St. Albans. His unique and quirky portfolio includes work for some of the UK's largest publishers.